In 2013 while on a cruise in the Mediterranean, Regina Catrambone saw a winter jacket floating in the sea. She knew it was the jacket of someone who had tried to get to Europe and, most likely, didn’t make it. In the midst of rising numbers of asylum seekers risking their lives to cross the Mediterranean, Regina and her husband Christopher decided they needed to do something. They bought a fishing boat, the Phoenix, with their own money, and Migrant Offshore Aid Station (MOAS) was born. 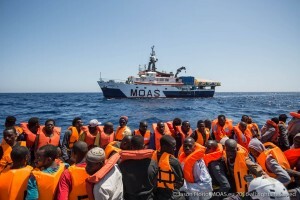 MOAS is the first private rescue ship in the central Mediterranean, and began with a 60-day operation off the coast of Libya, where tens of thousands of asylum seekers were boarding boats hoping to reach Italy. By October 2014, MOAS had given aid to over 3000 asylum seekers. Since then, the migrant crisis has continued to worsen, and European governments are struggling to keep up—Italy shut down its rescue operation Mare Nostrum in 2014 after the European Union refused to fund it—leaving a gap that private rescue operations and NGOs like MOAS are working hard to fill. MOAS has sent rescue missions to three different seas: the Aegean, where the relatively short but perilous crossing between Turkey and Greece has claimed thousands of lives; the Andaman, site of human trafficking and indentured labour for Rohingya refugees from Myanmar and Bangladesh; and the Mediterranean, where MOAS recently sent a new search-and-rescue mission to cover the “dead zone” near the Libyan shore, and where 700 asylum seekers died in just one week in May 2016. Analysts of the region believe that the climate for forced migrants will only worsen, as the EU hardens its stance towards asylum seekers, and instability in the Middle East and North Africa continues. This begs the question: At what point must governments, and not just generous individuals, step up? Does the political unpopularity of migration to the EU justify allowing thousands and thousands of people to die seeking better lives? We at 6 Degrees agree. It’s time to examine the forces that push people to risk their lives at sea, and the forces that cause people to reject them. It’s time to have these difficult conversations, because the alternative is being idle during the worst migration crisis since World War II. It’s time for 6 Degrees. A representative from the Migrant Offshore Aid Station (MOAS) will speak as part of 360 Exodus at the inaugural 6 Degrees in September 2016. Purchase tickets here.